Video Right: Lynn teaching Jen Jone's Maggie (Welsh Terrier) to weave. Weave training is a specialty of Lynn's and many Creekside dogs have stunning weaves. Not everyone has the time and/or equipment to train their own dog. Especially on something that can be tricky such as weave poles and contacts. No worries, help is here! It often makes sense to have me train these behaviors initially and then show you how to maintain them. I love training the dogs and am happy to take the pressure off you. I also do re-training work on dogs who have been started elsewhere but who have very common problems with weaves such as only weaving with the handler on a particular side or only weaving with excessive help from the handler. I've successfully re-trained these and other issues with a number of dogs. 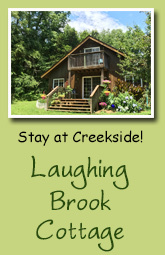 You can bring your dog to Creekside for training sessions on whatever schedule you choose. As your dog progresses, we can combine training sessions with lessons for you to practice at home. Drop Training is $30 per half hour. Another option is to devote part of a private lesson to having me work with your dog on weave or contact training. Once in awhile circumstances may dictate a board and train situation. This is where your dog actually lives with me and gets extensive training. This is something I only do in very rare and unusual circumstances. Rates for this will be on a case by case basis. Please contact me for further info. Sometimes problems in training are actually the result of something that is going on at home. The solution is often a home visit. Rates for this vary depending on how far away you live. Contact me for further info. Generally this service is only available to ongoing students.